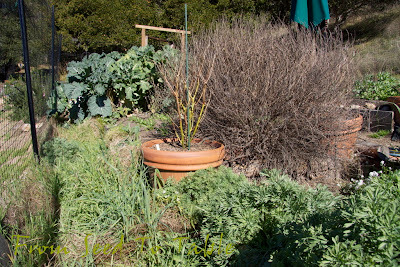 It's still a work-in-progress but I thought I would share the planting plan that I'm working on for the coming year. If you are familiar with Pam Pierce's book Golden Gate Gardening my spreadsheets might look familiar, much of it is lifted straight from her book. She has a chart in the book that lists a lot of commonly grown vegetables and graphically shows when they can be planted. I find that I'm constantly flipping to those pages when I'm thinking about starting something, either I wonder what the heck can I plant in January (or whatever month it happens to be) or I want to grow something new and I want a quick idea of when I should be sowing seeds for it. So this year I decided to copy Pam's chart and tailor it to what I'm planning on growing this year. 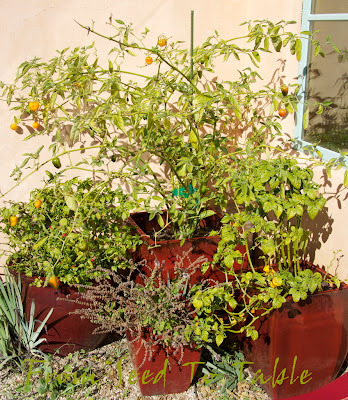 Golden Gate Gardening is an invaluable resource for gardeners in the San Francisco Bay Area and Coastal California. The climate here is so unique that the growing information on most seed packets and in most gardening books doesn't work well here. I credit much of my success in the vegetable garden to this book and I highly recommend the book to anyone who has a home vegetable garden in this area. So, here's my take on Pam's chart. The dark green shading means that seeds can be sown or plants can be planted out at those times. The light green shading means planting might be possible at that time but it's more iffy. Most of that shading stuff comes straight from the book, I added some vegetables and indicated best planting times according to my experience and the information in the text of the book. I've inserted lines after each vegetable to list the varieties that I'm planning on growing and also noted the sources for most of the seeds. There's some notes to myself about when I'm planning on sowing seeds where the shading indicates when plants can be planted out. 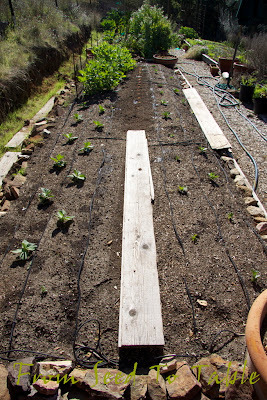 I plan on noting the dates that I sow the seeds and plant out transplants (we'll see...). If I can keep on top of things I might also show dates for the first harvests. And if I'm really really on top of things I should be able to start refining the chart to reflect my particular microclimate - hah! You might notice that there is no information about how many plants to start or where to plant them. I don't try to do that much planning in advance since that type of plan always seems to fall apart quite quickly in my garden, usually because I want to grow more things than I have space for. 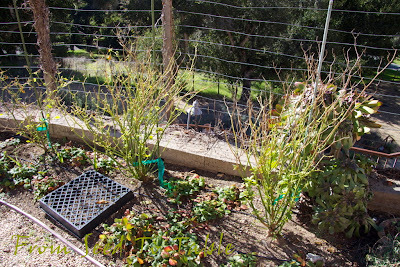 The long growing season here provides a lot of flexibility in the garden, I can often wait until I know that a space will be opening up in the garden before I decide what will go in there. Some things that have a short window for planting out and that need to be in place for a long period of time get planned well in advance. For instance, I know which bed the tomatoes will be in this year since I only have 4 beds and I rotate the tomatoes around them. So I'm only putting in quick cropping things in the tomato bed at the moment, like lettuce or other fast maturing greens. 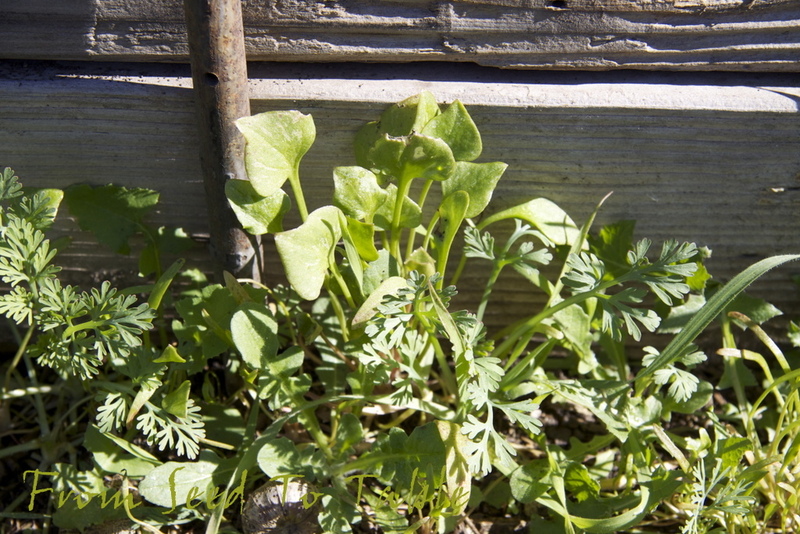 And the squash have a designated spot, they typically follow the winter growing favas in my garden (which follow the tomatoes), that timing has always worked well for me - but you won't see that in the chart below. Do you plan your garden in advance? What type of plan works for you? 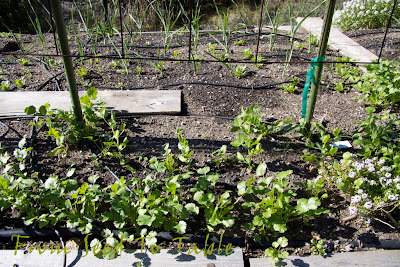 The garden yielded just a couple of harvests last week, a bunch of cilantro and Golden Chard. I'm only counting the cilantro because there's enough to actually look like an impressive amount. I don't usually tally the herbs that I harvest since it's usually in small quantities and used as it is picked. In the winter I can always count on having fresh thyme, rosemary, bay, and parsley. My oregano plants also do just fine in the winter but that is one herb that I prefer dried, it tastes too "hot" to me when used fresh. Now it seems that I can add cilantro to that list. 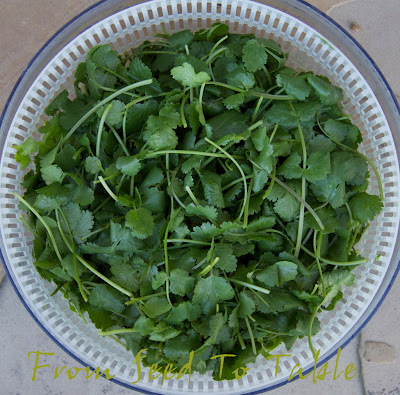 I've been letting cilantro bloom and set seed around the garden and as the seeds dry I pluck them off the plant and scatter them around. The plants grow when and where they choose and it seems that they've chosen to grow with abandon this winter. The bunch I harvested last week is destined for a batch of pesto. The chard was used in a recipe from the A16 cookbook (my husband seems to be particularly attached to that book at the moment). The leaves and stems were cut up separately and blanched until tender and then braised with a sofrito of garlic (two heads!) and salt packed anchovies. The sofrito was made by peeling the garlic cloves and simmering them whole with the anchovies in a generous amount of olive oil and a bit of water for an hour and then mashed to a paste. It was quite delicious, the long slow simmering mellowed the garlic and anchovies a lot, but the dish still wasn't for the faint of palate. I've also been making good use of previous harvests. Frozen fava beans were used with pasta (another A16 recipe that my husband chose). Canned tomatoes were used to braise yet one more dish from A16, the Monday Meatballs - oh so good. Dried Petaluma Gold Rush beans, frozen green beans, frozen beet greens, and frozen tomato puree joined up in a pot of soup. Part of the head of Romanesco broccoli that I harvested the week before was used with some purchased brussels sprouts in a gratin topped with bread crumbs and pine nuts (the recipe is from epicurious). And the last chunks of Marina di Chioggia squash and Diamante celery root that I had been using over the last couple weeks were braised with more frozen favas to accompany some gnocchi. So there's been some good eating around here thanks to my efforts in the garden over the past year. A lot of my readers wonder if I manage to eat all that produce that I grow, so I hope this answers that question! Oh, I forgot, we also munched on preserved eggplant last night and I used some frozen grilled eggplant in a panini last week. And I should also mention that I used ground dried chile peppers in a number of dishes including the meatballs, the soup, the panini, baked into Taralli Pugliese (so addictive), on ricotta bruschetta.... you get the idea. 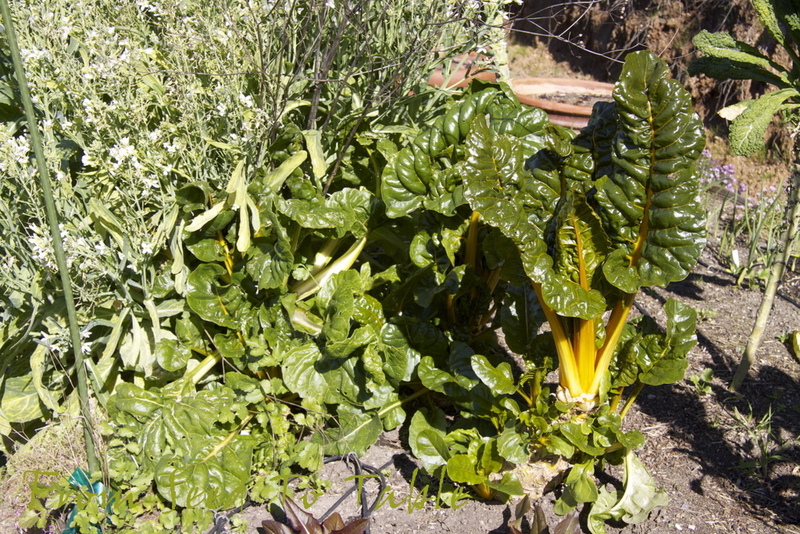 Golden Chard - 2 lb. The total for the week was - 2 lb., 5.5 oz. The total for the year is - 8 lb., 11.75 oz. It seems like ages since I last did a garden tour but it's only been a little over a month. Not a lot has changed since December 15. 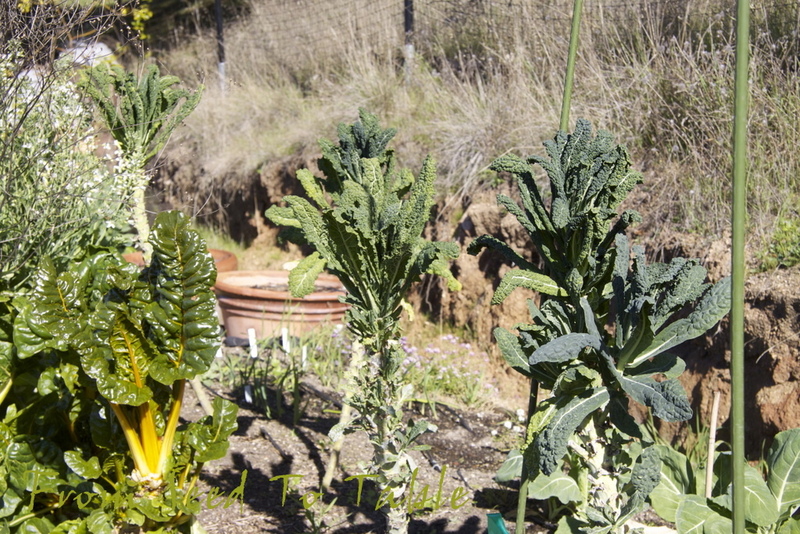 The Portuguese Dairyman's Kale is still hanging in there but it is just starting to develop flower buds so it's time to sow a spring crop. Hidden under the kale foliage is the remnant of a Malaysian Dark Red eggplant plant, complete with one eggplant. 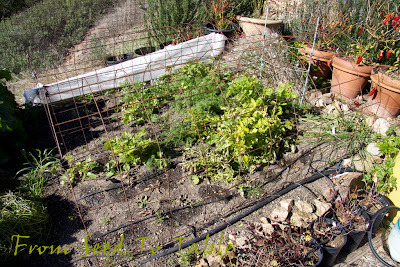 In place of the rest of the eggplant that was pulled out is a planting of Olive Leaf Rapini. I'm not sure why I persist in experimenting with winter grown potatoes, but here they are, zinged from spending a night uncovered when we had an unexpected frost. Oh well, the space would have been empty if I hadn't planted them and I can't stand to see an empty space in the garden. Across the main path, the bed that was purged of oak roots a month ago is now sporting emerging fava beans. 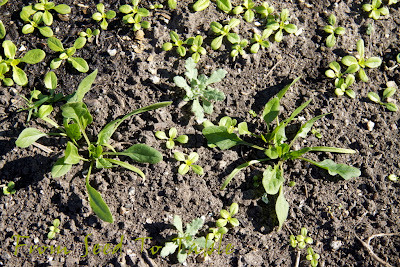 I planted the fava seeds on December 16 and they sat and sat and sat, I thought they were probably rotting away, and then finally the purpled seeded plants on the left started to emerge about 2 weeks ago and last week the white seeded ones on the right started to emerge. It looks like just a couple of seeds aren't sprouting. And I've slipped in a row of Ear of the Devil lettuce to see if I could get a few salads before the favas create a jungle in that bed. 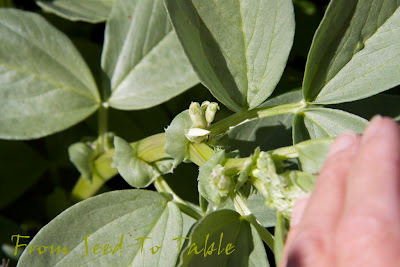 The fava plants that were sown back in November (I think) are developing the first flower buds. The next bed down has a lot more going on. Here's some more Ear of the Devil lettuce. I got the seeds for these plants from Gintoino and then found more seeds at Adaptive Seeds for the second planting in the Fava bed. 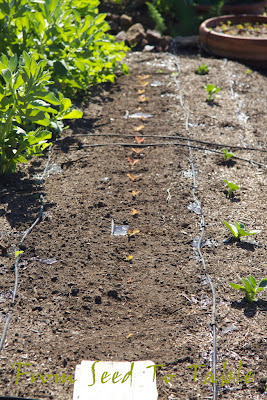 It will be interesting to see if those come out the same as the plants shown below. I just love the look of that lettuce and I hope it is as tasty as it is pretty. 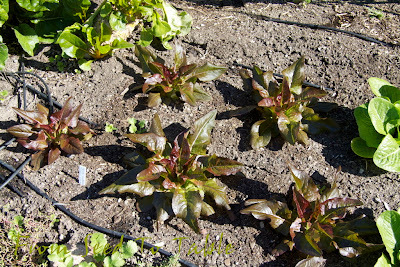 There's also some Sweetie Baby Romaine lettuce in the same bed. 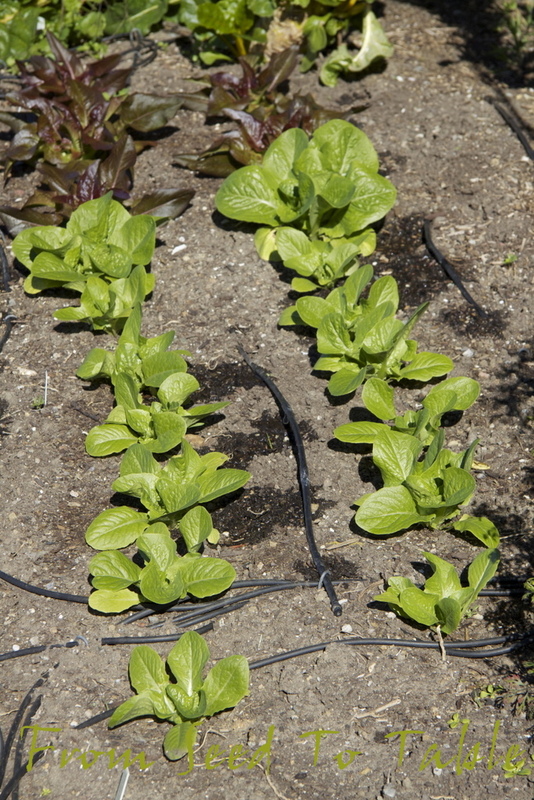 I sowed the seeds for all these lettuces back in October and transplanted them into the garden in December. The short cold wet days kept the plants really small. 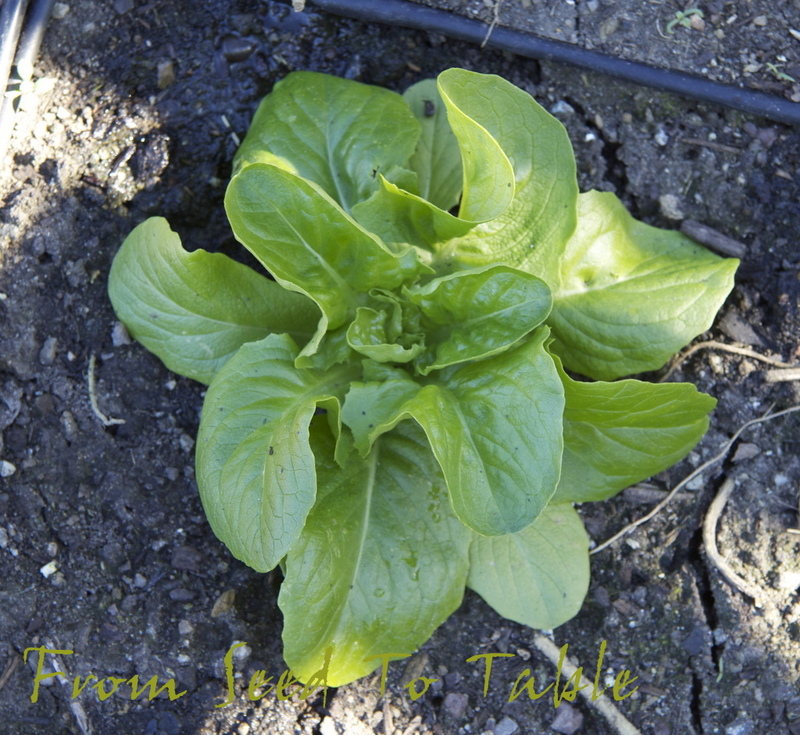 We've had warm sunny weather with more mild nights for the past week which has really sped up their growth. 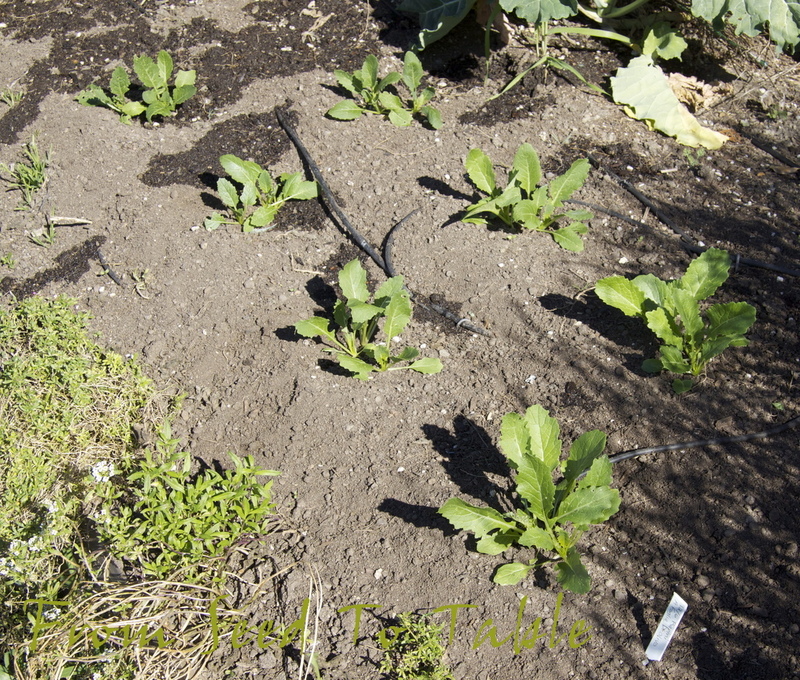 I also set out a few butterhead lettuces at the same time. Those were more difficult to photograph today because of the shadows that dappled that part of the bed. 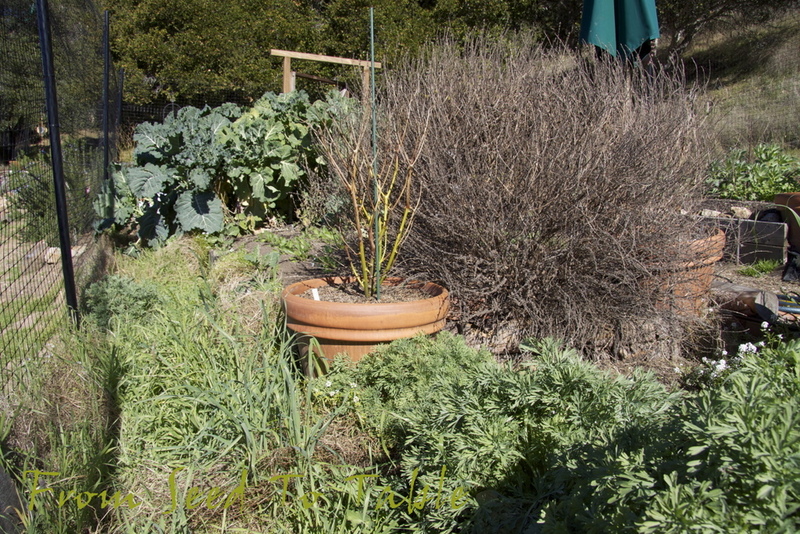 The Golden Chard is doing just fine, no signs of bolting yet, but I'm starting new plants anyway because they will bolt sooner than later now that the days are getting longer. 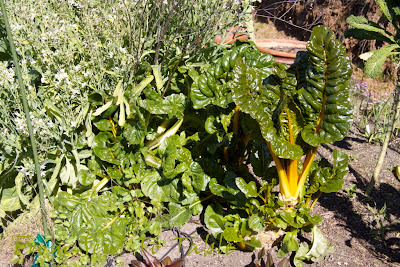 Next to the chard and encroaching on one of the plants is the Couve Tronchuda (Portuguese Cabbage) that bolted in the warmer than usual fall weather last year. I've just let it bloom its heart out because the bees adore it. Here's the replacement Couve Tronchuda plants that I'm experimenting with trying to start in the dead of winter. 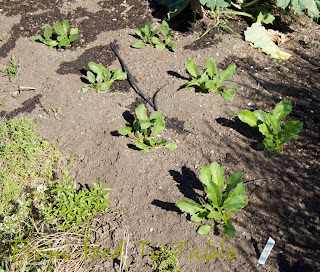 And another experiment with trying to start something in the dead of winter - Guntmadingen Winter Spinach, winter spinach because it should grow through the winter if you start it early enough, not that you should be able to start it in the winter. Well, I'm not always one to follow the rules and recommendations... 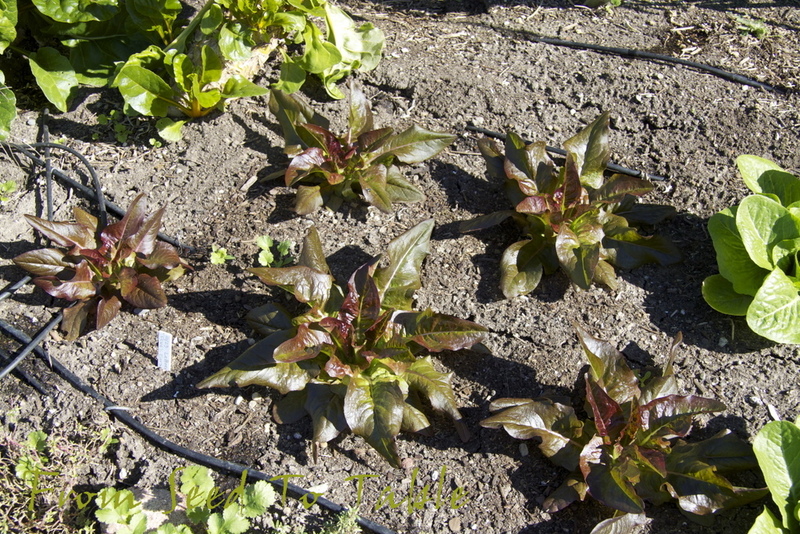 There's also a lot of Golden Corn Salad volunteering in this part of the bed. I'll be harvesting that as whole rosettes as they size up. The Lacinato kale has been reluctant to grow this winter and now it's showing signs of starting to bolt. 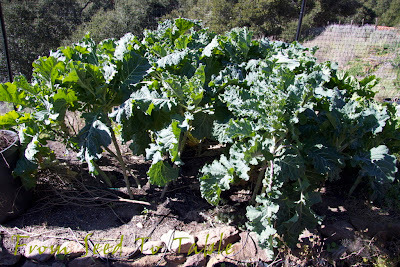 This is my favorite variety of kale and I'm quite disappointed that I didn't get to harvest much of it this winter. I should get one more small harvest, but you can see that a lot of the leaves are yellowing and the smallest leaves at the top won't get much larger because the plants are putting their energy into producing flowers now. 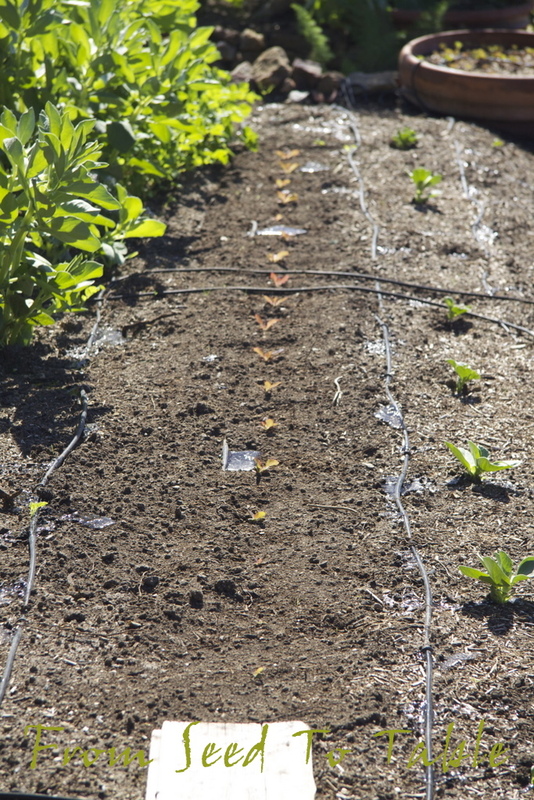 It's time to sow more seeds for a spring crop. I planted the smallest cloves of my seed garlic in close formation so that I could harvest them green like scallions. 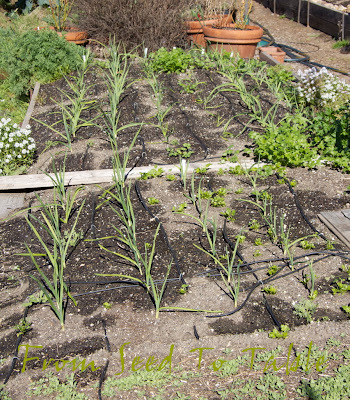 They don't need much space since they are harvested before they form bulbs. 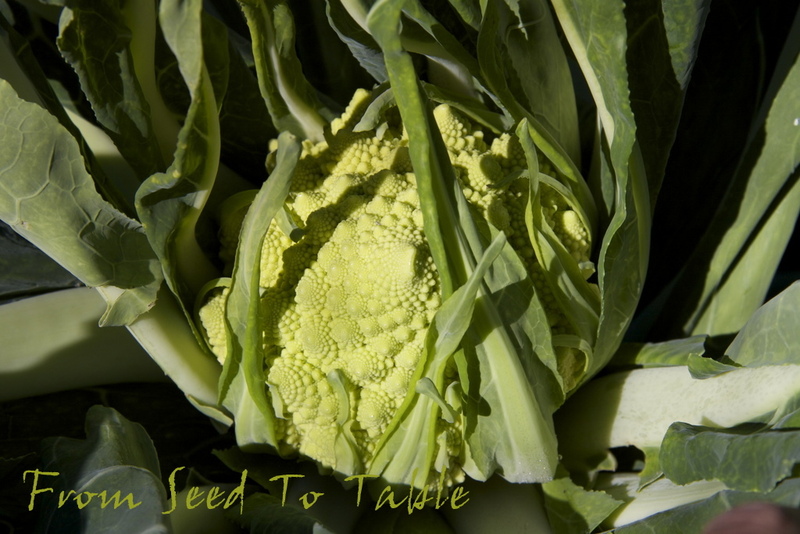 And the fourth and last Romanesco broccoli plant is quickly forming a head. This is the best looking one of the bunch and should be ready to harvest in a couple of weeks, maybe sooner. Over in the next bed I've planted enough garlic to fend off a whole family of vampires. But the vampires have been practicing voodoo on the garlic plants, there's rust already, bad bad bad news... 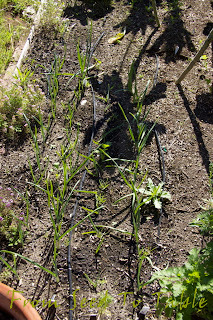 I predict a really crappy year for garlic in my garden. Look closely and you might see the little baby snap pea plants a the base of the trellis just beyond the cilantro (coriander). I started the peas indoors in paper pots and planted them out a few weeks ago. They seem to be doing ok so far, slow to grow like everything else at this time of year, but healthy looking. 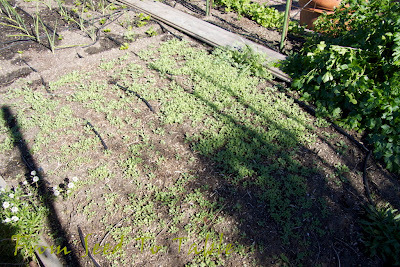 I've scattered cilantro seeds around a lot of the garden and it seems to thrive in the cold wet winter weather. 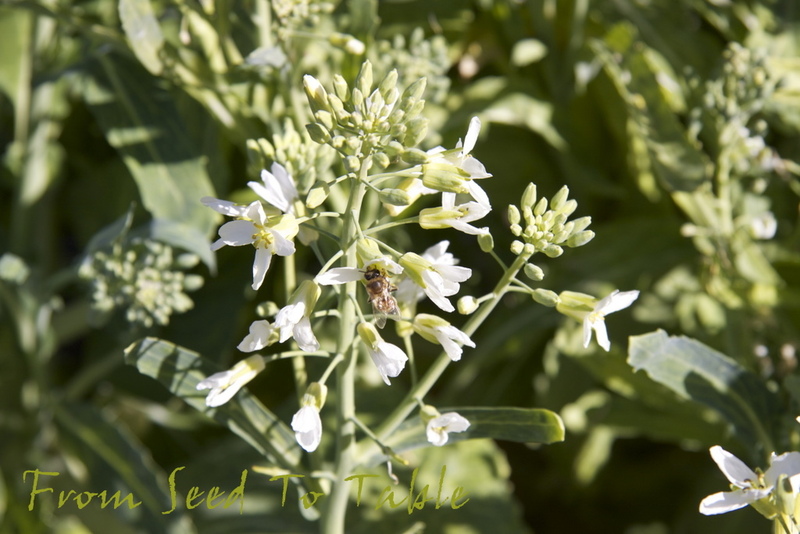 I will allow a number of the plants to flower since the beneficial insects are drawn to the blossoms in droves. 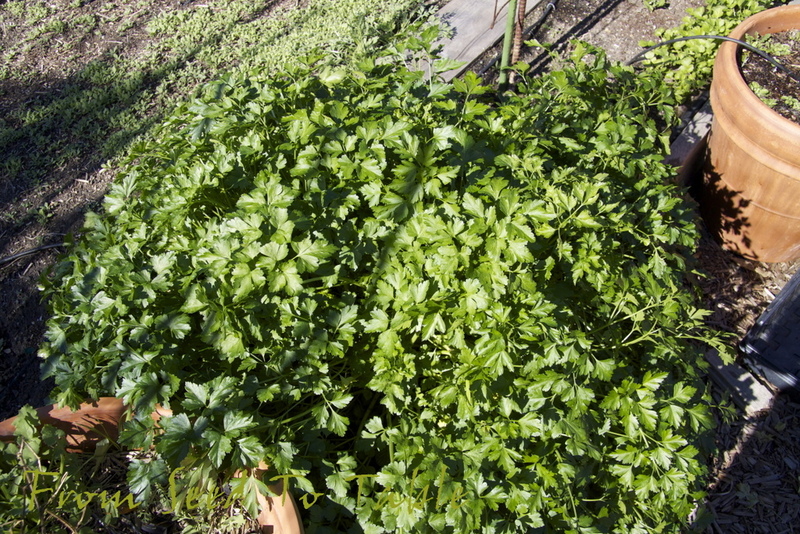 The Turkish parsley is also unfazed by the winter chill and damp. This one patch has supplied me with all the parsley I could possibly use through the winter. 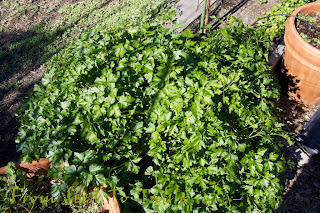 I really like this strain of parsley, it is quite similar to the giant flat leaf Italian parsley that I've grown for years but the leaves are a bit more finely cut and are more tender and just a tad less strongly flavored. And in this corner of the bed is a patch of Monticello breadseed poppies in need of a drastic thinning. This bed is where the native Claytonia likes to volunteer each winter/spring although the happiest plants are volunteering in the path. A few more ugly bits. In this corner, pepper plants in all stages of suffering from winter chill (please ignore that really messy junk in the background). 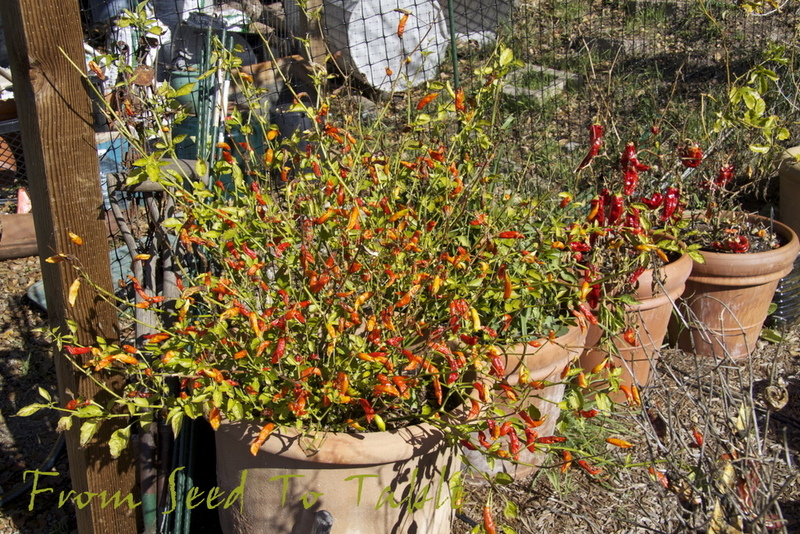 Although this one plant (Iberian Long Cayenne) is in pretty good shape. 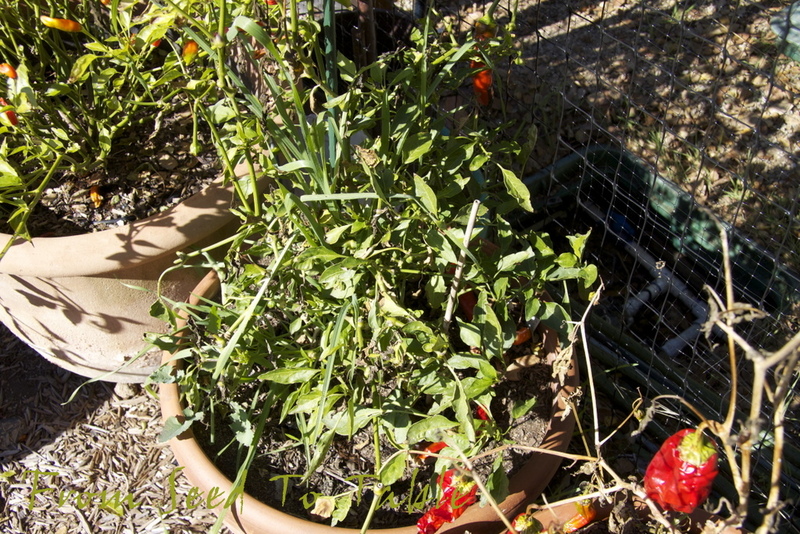 Perhaps it's the protective properties of allowing weeds to share pot space? 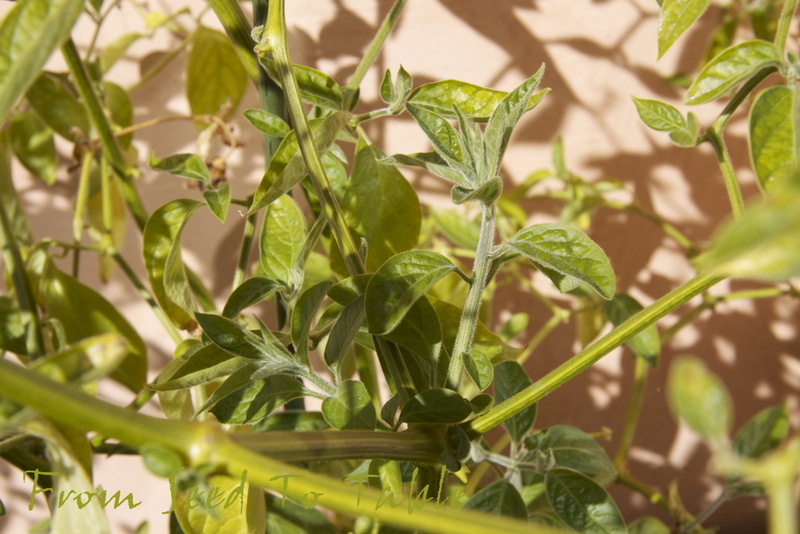 I had hoped that this Aji Santa Cruz would come through the winter with enough life left to make a comeback in the spring, but it's not looking very promising. What the frost hasn't zinged some fungal infection seems to be moving in on. It's ok, this variety ripened so late that I didn't get enough to make it worth growing again. But over in front of the house a couple plants of one of my favorite baccatum chiles (Christmas Bell) are doing a bit better. I know it's hard to tell from the photographs, uh yeah, how do those plants below differ from the one above, they all look dead... Well, trust me, there's a lot more life left in these plants than that one. 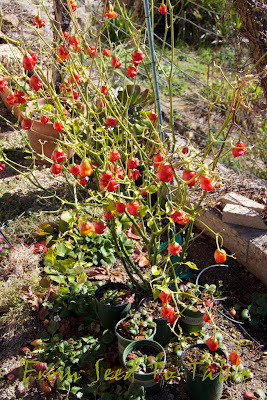 Here's the Picante Christmas Bell, also with a lot of life left in it. 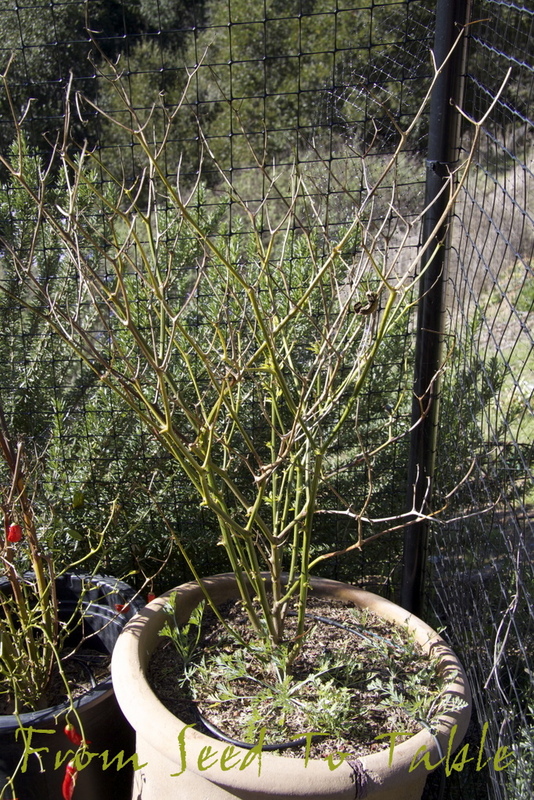 Most of the chiles hanging on the plant are actually in pretty good shape. The bad news in this bed is that another of my favorite baccatums (Kaleidoscope) is totally dead. 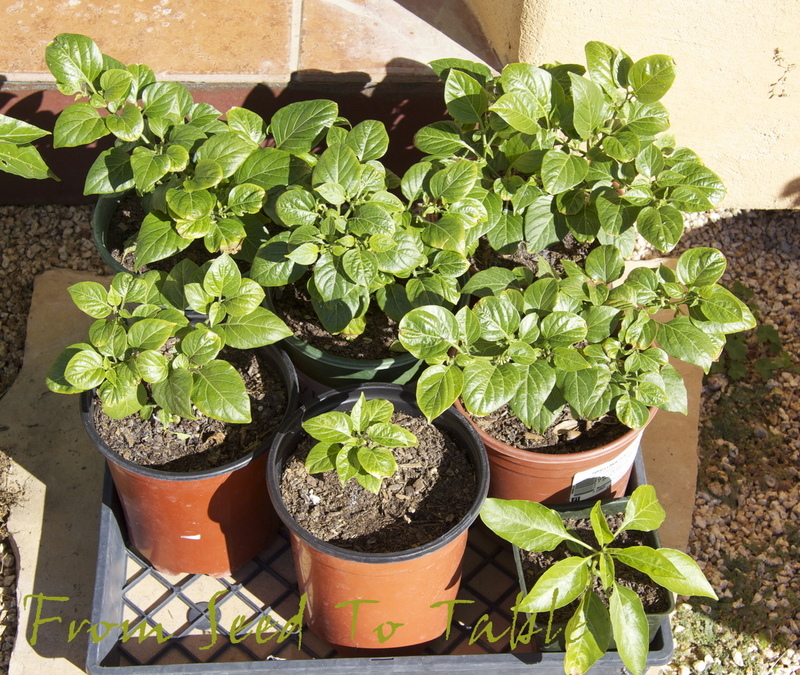 I liked that chile a lot and it was quite productive so I'll start some new plants for this year. And the corner bunch is still hanging in there. 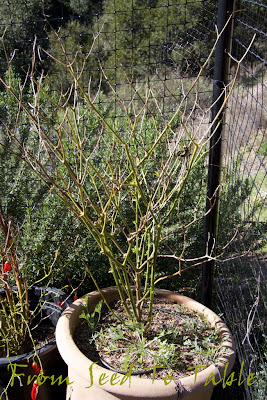 The Manzano plant is starting to produce nice healthy new growth already. 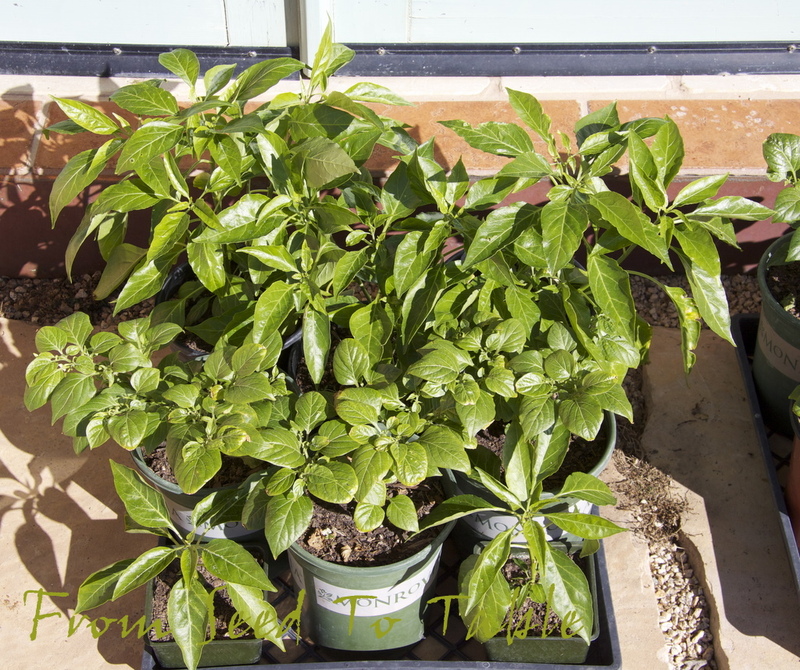 And the pampered pepper pets that get to sleep indoors at night are looking ok. The pampered pets are a bit of a pain since the have a perpetual population of pesky aphids. 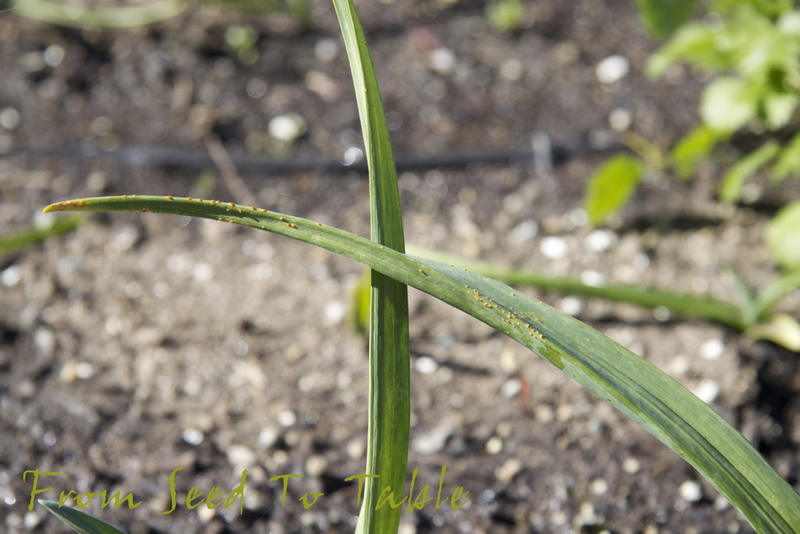 I've been giving them weekly squirts with the hose to wash off the aphids, but the boogers keep reappearing. It will be nice when they can spend all day every day outside where the beneficial insects can lend a hand. That's it for the latest tour. Thanks for stopping by! 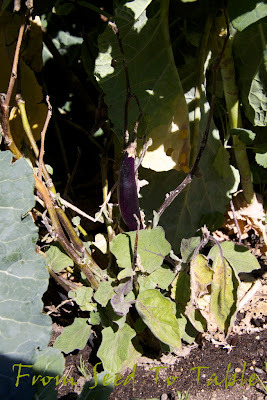 Yay, there was something different coming from the garden last week! The first harvest of mâche from the volunteer patch in the garden. 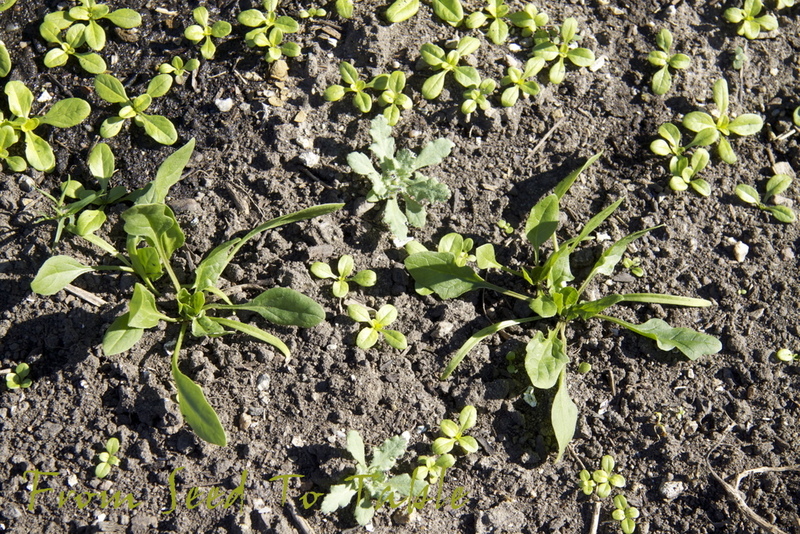 This is mostly Golden Corn Salad (Valerianella eriocarpa) and a few rosettes of Gala mâche. That's not a big salad bowl full of greens, just an individual soup bowl, so I added a few handfuls of pea sprouts from the farmers market and dressed it all with some balsamico and extra virgin olive oil for a simple side salad. The third head of Romanesco broccoli from the garden is the prettiest one yet. I managed to harvest it before it got too big, although some of the lowest florets on the stalk were starting to elongate and open up just a bit, those are the leafier ones bunched together on the right. I used the previous head of Romanesco in a pasta dish. The head was cut into bite sized pieces and braised in a couple of cups of turkey stock spiked with some fish sauce and garlic, then tossed with some seared sweet onions and sauteed chanterelle mushrooms (tis the season around here) a couple tablespoons of crème fraiche, a touch of truffle butter and pasta. And don't forget the parmigiano! Last week I also used most of one Marina di Chioggia squash that I had harvested in the fall. Part of it was used to make Roasted Butternut Squash with Pancetta and Chiles - a recipe from the cookbook A16 by Nate Appleman. That cookbook is one of my husband's favorites, not that he actually cooks, no, not really, just about never, but he loves to peruse the pages and point and plead - ooh make that, please... Well, I have to admit, he's got a pretty good eye for a good recipe, so I usually humor him. And he was right about that recipe, it's delicious. I used more of the squash to make Crusted Pumpkin Wedges with Soured Cream - a recipe from the cookbook Plenty by Yotam Ottolenghi. The "crust" is grated parmigiano, bread crumbs, herbs and lemon zest. That dish turned out to be a winner also (I can pick 'em also honey!). That cookbook is a new one in my library and I think it's going to become a favorite. I had never even heard of it before last week when it mysteriously came in the mail. No note and no recognizable return address (I don't know anyone in South Bend, Indiana). And stranger yet, it's a British imprint that's not been adapted for American kitchens. Hmmm, where did it come from? It looks like a winner, whoever sent it knows what I like... It's full of recipes using fresh seasonal vegetables, mostly Mediterranean inspired but also some Asian and a few other inspirations from around the world - that pretty much describes my usual style of cooking. My husband had the mystery figured out in no time - "let me call my sister". Yup, my SIL, a resident of Toronto, had spied it in a list of Top 10 Cookbooks in the newspaper there, ordered it online and had it sent directly. Thanks Judi! Oh, and the recipe for pear crostini with goat cheese was a hit also. Yet one more dish that I made last week with some of that squash and some of the celery root that came from the garden last year was Roasted Winter Vegetables in Puff Pastry, a recipe from the San Franciso Chronicle (lots of great recipes there, not surprising considering what a foodie town SF is). That and a salad of spinach and roasted beets with slivered toasted almonds made a fabulous dinner. 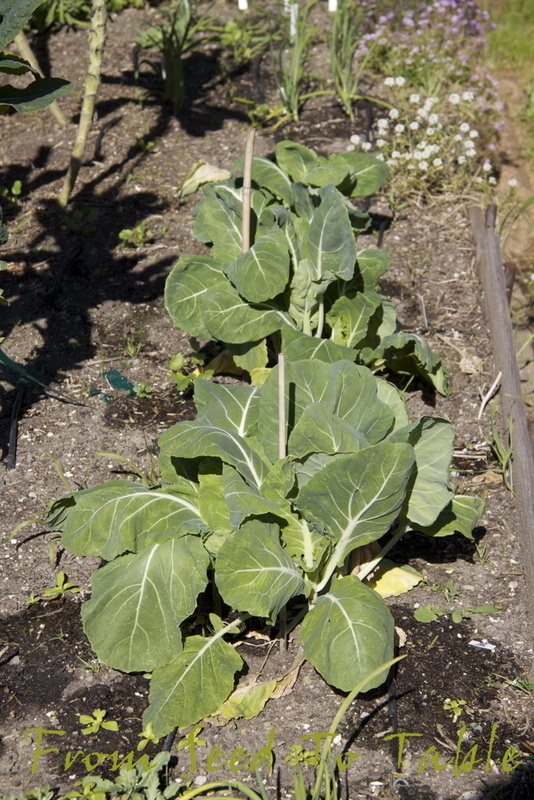 Portuguese Dairyman's kale - 5.5 oz. Golden Corn Salad - 1.25 oz. 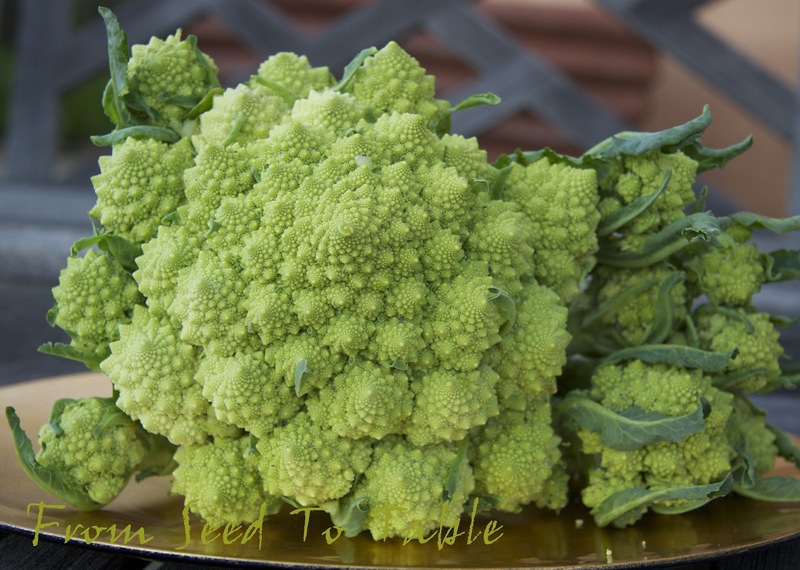 Romanesco broccoli - 3 lb. The total harvest for the week was - 3 lb., 7.25 oz. The total for the year is - 6 lb., 6.25 oz. Harvest Monday is hosted by Daphne on her blog Daphne's Dandelions, head on over there to see what other garden bloggers have been harvesting and cooking up lately. Romanesco broccoli - 14 oz. Golden Chard - 1 lb., 8 oz. The total harvests for the year are up to 2 lb., 15 oz. I still had about a pound of the first head left in the refrigerator (thank goodness it keeps really well). That went into a batch of Spiced Romanesco Broccoli Soup. I'm not sure what I'm going to do with head #2 that's spending time in the cooler now but I'll have to figure out its fate soon so that head #3 can take its place. Harvest Monday is hosted by Daphne on her blog Daphne's Dandelions, head on over there and check it out. 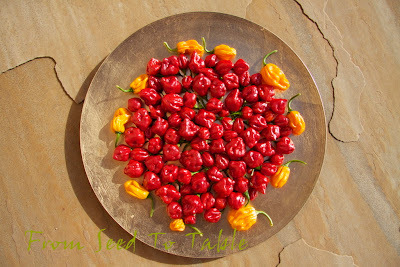 My last harvest for 2010 was, of all things, chile peppers! The Rocotillo plant that I have overwintering indoors yielded 9 more ounces of good peppers when I finally stripped it on December 28. And the Suave Orange plant that is enduring winter outdoors in a protected corner yielded 1.25 ounces of ripe peppers. When I checked my spreadsheet of 2010 harvests I was amazed to see that the Rocotillo plant produced more than a pound of peppers last year. I sure hope that that plant makes it through the winter in one piece. Unfortunately the branches have a tendency to, well, not fall off the plant but they do break off easily and I've already lost, um, knocked off four. 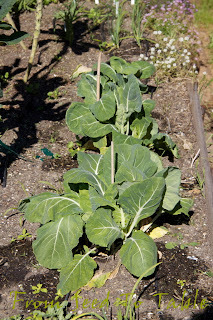 My first harvest for 2011 wasn't photographed but I'm sure you would recognize it if you saw it, it was 9 ounces of Lacinato kale. I barely remembered to weigh the harvest. I've harvested so little lately that I'm getting out of practice. 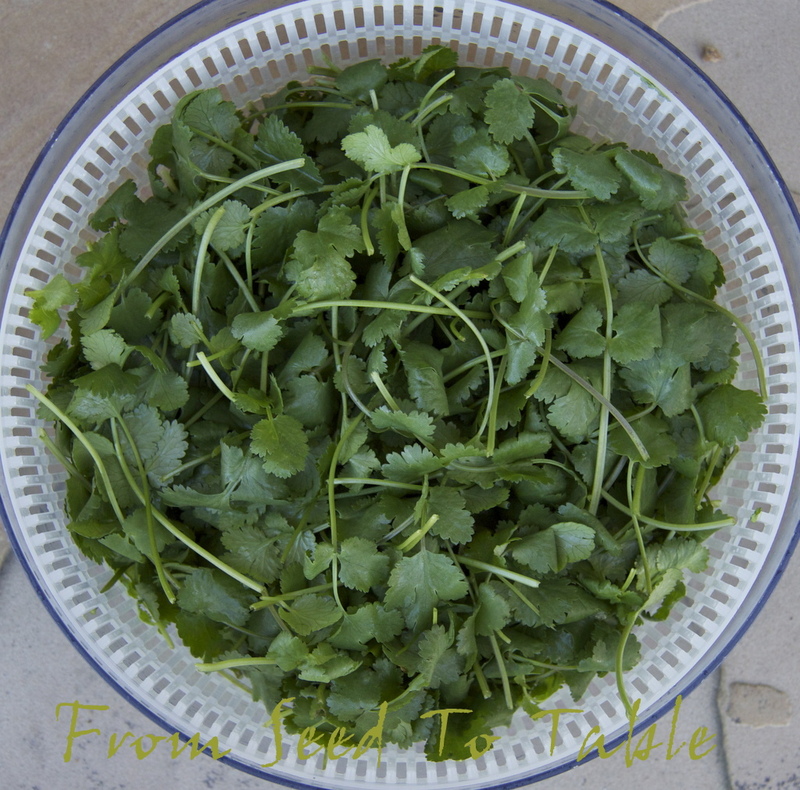 I used the kale to make one of my husband's favorite hearty, healthy, peasanty dishes. I tore the kale into pieces and braised it with sauteed garlic, a splash of Vietnamese fish sauce (aka Secret Sauce for the less adventurous eaters), and water to cover until it was quite tender. The braised kale was piled on top of toasted rustic bread along with the braising liquid (be sure to do this in a warm bowl), topped with a couple of soft poached eggs, drizzled with some bright green new olive oil (Olio Nuovo from McEvoy Ranch), and sprinkled with flakes of slow toasted Aji Angelo peppers. Yum! 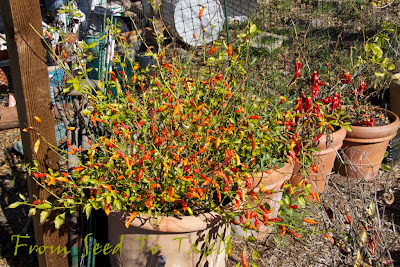 The chile pepper harvest brought my total harvests for 2010 to 711 lb., 1.5 oz. The harvest total for 2011 is off to a whopping start with 9 oz. I'm not going to do a 2010 harvest recap here but if you're interested in seeing what I harvested during the year I've put spreadsheets of all my 2010 harvests along with most of the photos that appeared on my Harvest Monday posts on a separate page which you will find here. 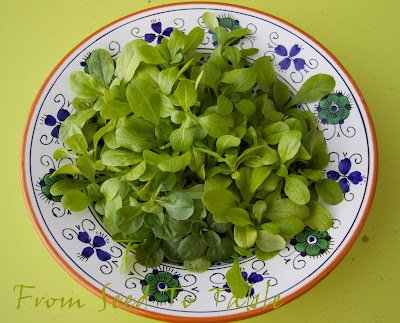 Harvest Monday is hosted by Daphne on her blog Daphne's Dandelions, head on over there and check it out!